Box office champions (and three Golden Globe nominees): Coco (top), (left to right) I,Tonya, Paddington 2, The Disaster Artist. 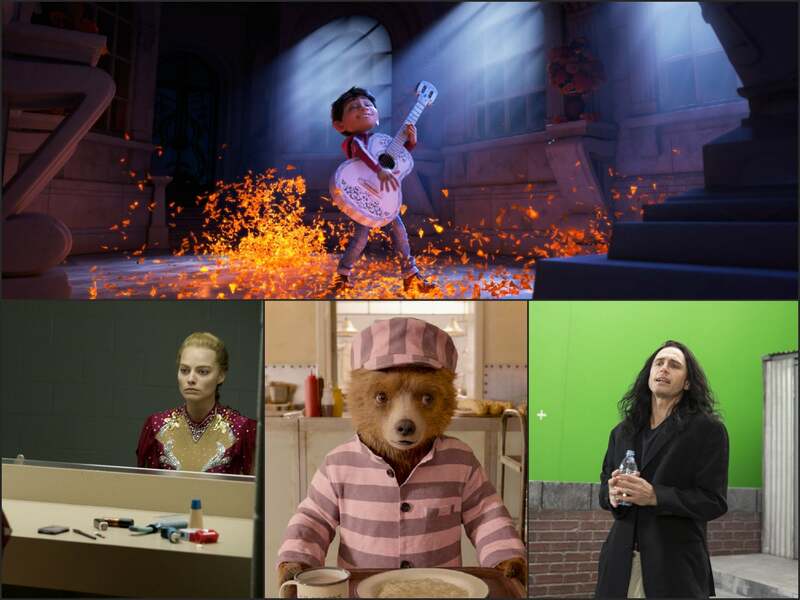 Another slow pre–Star Wars weekend saw Coco – a nominee for the Golden Globe of Best Animated Picture - take first place again both in the US and overseas, while James Franco’s The Disaster Artist scored big at home with a push into 840 theatres. TDA, which received two Golden Globe Nominations, Best Motion Picture-Musical or Comedy and Best Actor – Musical or Comedy for James Franco- made $6.4 million this frame taking its domestic cume to $8 million. Foreign plays were worth $1 million, and combined with limited screenings last week in its three offshore markets - Australia, New Zealand, and the UK - took its global cume to $9.7 million. Octogenarian opener Just Getting Started, starring Morgan Freeman and Tommy Lee Jones, came out stillborn with just $3.2 million from 2,161 locations in the US and Canada. Freeman stars as Duke Diver, the main man at a desert retirement community. He has a lock at everything at the home, from bingo to grey-haired girls, until Jones’s fast-talking, barely walking character Leo moves in and gives him a run for his social security check. Broad Green Pictures is distributing and with a $22 million budget, for now, this load looks somehow too heavy for Just Getting Started’s titanium hips. Worldwide box office Coco meanwhile kept up the pace with $18.3 million in the US and $55 million overseas, topping the podium in both reporting zones. Chinese audiences continue to flock to this one, this weekend to the tune of $35 million. Family values and especially the strong connection to the character’s ancestors seem to be the bridge between the seemingly disparate Latin and East Asian cultures. This previously unexplored cultural tie has given Pixar, whose films have struggled to find footing in the Middle Kingdom, its biggest win to date in the country. With its China grosses at $127.8 million, Coco has nearly equaled its US take of $135.5 million, and sits at a global total of $389 million. It’ll have a clear path to even more yuan as Beijing’s foreign film ban will keep out any non-local competition until January. Coco also received a Best Original Song nomination for “Remember Me”, by Kristen Anderson-Lopez and Robert Lopez. Still in China, British teddy bear adventure Paddington 2 debuted to a strong $16.7 million. Local reviews are glowing and its cume there is already just $1 million shy of the original’s entire run in the country. Other standout markets are Germany at $3.7 million, Italy at $3 million, Sweden at a locally robust $1.9 million, and Spain with $1.15 million. The film’s home country, the UK, has grossed $39.2 million. Paddington 2 moves into US theatres on January 12. On the specialty market Best Picture – Musical or Comedy nominee I, Tonya got off to a good start with $245,602K from four locations. Margot Robbie stars as disgraced figure skating champion Tonya Harding in a story that follows her rise and fall from the world stage. Allison Janney plays her insane gold-medal obsessed mother, and Sebastian Stan plays her husband Jeff. Robbie got a Best Actress nomination in the Musical or Comedy category while Janney had the same honor as Best Supporting Actress. Distributors Neon and 30West plan to keep I, Tonya in extremely limited release until January, giving it the theatre time necessary for awards consideration. Next weekend will, of course, be all about Star Wars: The Last Jedi. Disney’s latest franchise release will undoubtedly dominate the global charts for a month or possibly more. Fox Animation’s Ferdinand is the only picture opening against it, hoping to pick up something from the slim counterprogramming market.